Enterprise software comes in two primary varieties: proprietary and open source. Proprietary solutions include things like Oracle databases, Microsoft operating systems and SAP applications. These vendors develop the code and do not allow it to be dissected by a customer; all innovation comes from the vendor. In contrast, open source software is openly shared; end customers can modify and innovate upon that code (as long as they agree to certain base parameters). In this world of digital transformation, where businesses are trying to amplify the rate of innovation and cycle through change faster, proprietary software can’t keep pace. Open source often has armies of contributors, giving it and advantage with today’s demand for innovation. The two events brought unique open source perspectives as a business and as a community. 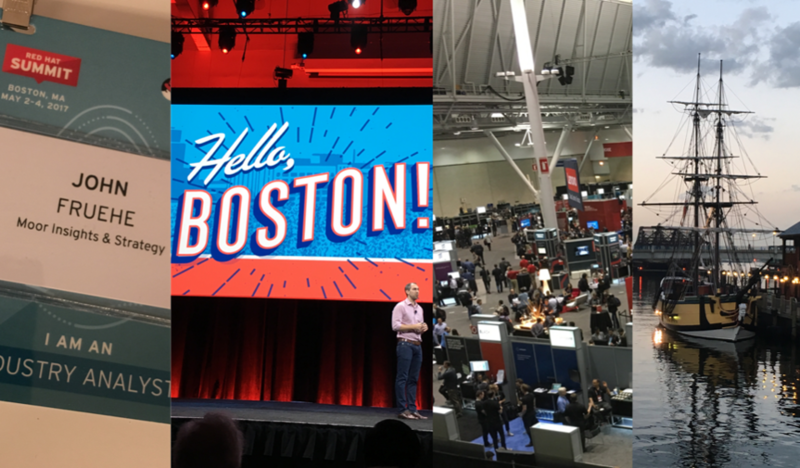 The first, Red Hat Summit, was a look from the business side, as Red Hat RHT +10.00% is one of the largest open source vendors, commercially selling its open source operating systems, applications and development tools. Its latest offering, OpenShift.io, is a complete online development environment and toolset for building the agile cloud-based applications that enable businesses to accelerate innovation. Competing with the Amazon Web Services – +% (AWS) development environment, OpenShift.io enables a completely cloud-based development environment (though not nearly as robust as AWS yet) which enables developers to create cloud-native applications that are more deployment agnostic. This is critical because a primary complaint of AWS is the potential for lock-in, essentially making the cloud proprietary—if you want those features you must host your app there. Openshift.io still creates some degree of lock-in with its tools, but hosting options are more flexible, including on premises. The Red Hat developers who I spoke to were from large, blue chip companies. Along with the desire to prevent proprietary lock-in, their top concern seemed to be the stability of the environment. Most were more confident that the transparency of open source was better as they saw too often that proprietary solutions were updated and patched at a slower rate, leaving businesses at the mercy of vendors. At the second event, OpenStack Summit, we could see the demand for a complete cloud stack. OpenStack enables both businesses to build private clouds for their own use or hosting providers to build clouds that can be sold as a service. OpenStack is not a commercial company, it is a community effort, so the event focused on collaboration. Much of the discussion was around getting more focused so that OpenStack solution providers could get clouds up and running faster, showing they are listening to end customer input, as deployment is still a big hurdle for most. Deployment is getting easier as we recently wrote about how OpenStack storage is maturing, and now that there are more options, the community needs to help make more targeted offerings. Here, instead of developers talking about their respective companies (and there were many of the same big names), most developers talked about collaboration and the community. OpenStack is primarily being deployed today by telecoms and cloud service providers, but the focus is widening as commercial customers are kicking the tires more frequently. Almost universally at both events, people cited open source’s flexibility, which enables a more agile response to business needs, as the reason they were not considering proprietary solutions. When the pace of change was slower and more predictable, proprietary solutions were fine; proprietary solutions had well-defined roadmaps and release cycles, providing confidence for IT departments. If you just followed the market norms everything was fine. But in this era of digital transformation, where information has become less standardized with higher velocity, the old traditional IT solutions just don’t cut it. The need to be more innovative and get out ahead of the crowd is driving IT to look outside of the proprietary box, where open source delivers that flexibility. Tech giants like Microsoft MSFT +0.61% or Oracle ORCL +1.25% aren’t on the ropes yet, as even they are trying to make sense of open source. Both have large initiatives to bring open source solutions into their product lines, as they see the same advantages that end customers are seeing. But, more importantly, they are seeing that customer demand for open source is increasing; if they are not in the game, they can’t compete effectively. While far from perfect, open source has its place in every major IT organization. Open source drives almost all of the cloud platforms, and with companies becoming more cloud friendly, we can only assume that we will see more open source being deployed each year. Deploying open source will be the only way for a company to stay competitive in the future. The companies that are creating open source solutions and the community efforts that are driving the development needs will have a lot to offer in these changing times.